The video and photo sharing platform, Instagram, has proven to be a very valuable addition to the social networking arsenal. Not only does Instagram generate a huge amount of traffic, Instagram’s engagement rate far exceeds that of Facebook and Twitter, which is why over 85 percent of top brands are regular users. This means that if your brand or business is on Instagram you have a better chance of attracting new customers AND converting them than other social networks. 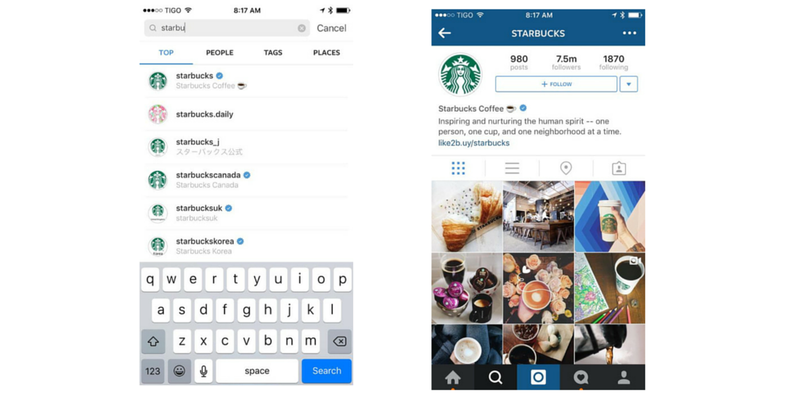 The more active your Instagram account, the more you will capitalize on Instagram’s incredibly high engagement level. That’s why it’s so important to grow your Instagram account. In order to do this you need to engage people in your industry (or geo-targeted area if you’re a local business) and enhance this with the savvy use of hashtags, and captions. Since Instagram does not allow you to add links to posts, the bio serves as the only space for links on Instagram, and the link in your bio is crucial for driving Instagram website traffic. Make sure your username closely reflects you, your brand or business, and your message, and try to update the link on your profile as you post. If, for example, you penned a new blog post, you could change the link on your profile and include a prompt to click the link to get to the article. You’ll note that we do this on an almost daily basis. Make sure to Include your company name and contact instructions in your bio. The contact information could be in the form of a phone number, link to a web or blog, an email address, or physical location. You’ll see many influencers leave this on their bio, it’s an easy way for sponsors to reach out to them. Make use of your brand hashtag, consisting of your company name, or a tagline in the bio. 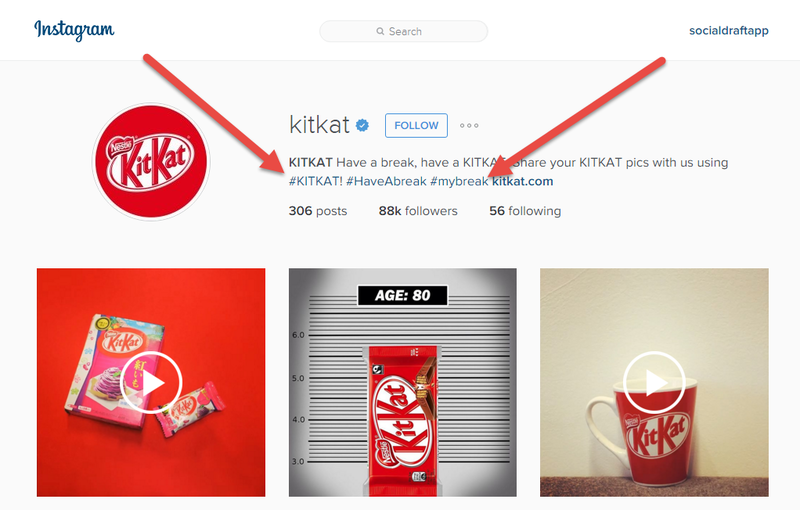 KitKat’s brand hashtag is the tagline: #HaveABreak. They use it on all their social sites, and they use it to engage with the social KitKat community. In your bio, you can lure your Instagram fans to connect with you on other platforms such as Twitter, Facebook, Pinterest, or Snapchat, by using the username for other social channels. However, the username or business name should be the same on all your social media accounts so people know your profile belongs to your company and not a fraud. Since visuals are processed 60 thousand times faster than text, and to create a little personal magnetism with your brand, you could add emojis to your Instagram bio. Emojis amount to visual expression and will also help you get more likes, comments, and shares on Instagram. Emojis are an international language that attracts readers worldwide. These look ok on your desktop – but amazing on your mobile. You can include a link to your website in your bio, or a link to a product or promotional event. You can also include a link to any article you may want to use for a detailed description of a product or service you would like to advertise, explaining to fans that the link to learn more can be found in your bio. You could space your bio out vertically rather than horizontally. This makes your bio easier to read. On Android devices, you press the Enter or Return key on your keyboard to drop down a line. For iOS users, you use the Next key instead of a Return key to drop down to the next field. 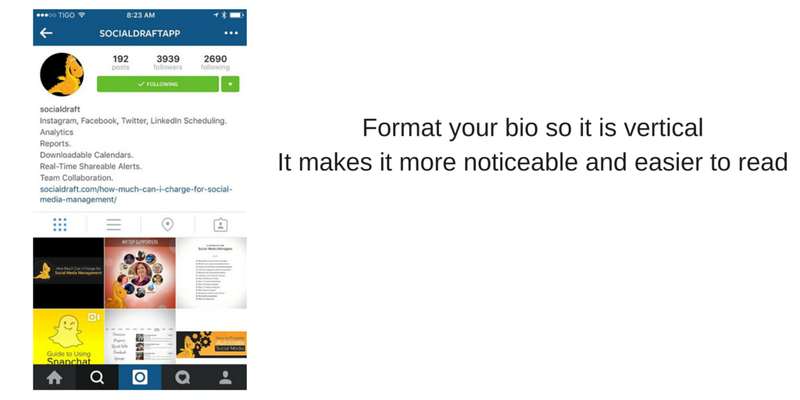 Using iOS you can also compose your bio in another app, such as Notes, and then copy and paste it into Instagram. But don’t forget that your Instagram bio is only there to enhance your efforts. It is incredibly important to be consistent – post on at least a once daily basis AND engage your community & those you want to become part of your community. You can schedule posts to Instagram via the Socialdraft dashboard. You will receive an SMS which makes it super easy to post. And our Instagram photo search will help you find the people who are talking about your brand so you can engage them, amplify their content, and build brand advocates.